In this 2001 quest to find the perfect meal somewhere in the world Bourdain heads to Japan where he eats traditional Fugu which is poisonous Blow Fish and a licensed chef is request to cook it. In Saigon he is treated to live Cobra Heart. He visits Moscow to London in search of the perfect meal. The copy is a Signed First Edition. 2001-04-09. New. Ships with Tracking Number! INTERNATIONAL WORLDWIDE Shipping available. Buy with confidence, excellent customer service! New York: Bloomsbury USA. 2001. First Edition; First Printing. Hardcover. 1582341400 . Near Fine in a Near Fine dust jacket. ; 9.3 X 6.0 X 1.1 inches; 288 pages . Raincoast Books. Hardcover. 1551924293 New Condition. . New. Raincoast Books. Hardcover. 1551924293 Like New Condition. . Fine. Bloomsbury USA. Hardcover. 1582341400 Like New Inside and Outside. Clean and crisp pages w/no markings! You will be pleased. Excellent book! Inscription on 1st page. ( z1s153D ) Some very minor shelf wear on dust cover. ** Fast Shipping** . Fine. Bloomsbury Publishing, 2001-11-19. Hardcover. Used:Good. 2002-09-05. New. Ships with Tracking Number! INTERNATIONAL WORLDWIDE Shipping available. Buy with confidence, excellent customer service! 2001-12-04. Good. Ships with Tracking Number! INTERNATIONAL WORLDWIDE Shipping available. May not contain Access Codes or Supplements. May be ex-library. Shipping & Handling by region. Buy with confidence, excellent customer service! HarperAudio, 2001-12-01. Audio Cassette. Good. Bloomsbury Pub Ltd, 2001. First UK edition-first printing. Hardcover. Near fine/Near fine. Near fine condition.Bloomsbury,2001.First UK edition-first printing(10 9 8 7 6 5 4 3 2 1). Black hardback(silver lettering to the spine,small nick and dent on the edges of the cover) with Dj(small tear on the edges of the back Dj cover, creases and nicks on the edges of the Dj cover),both in near fine condition. Nice and clean pages with two small ink marks and light shelf wear on the outer edges, Nice and clean book with light shelf wear on the Dj cover. Price un-clipped.284pp. A collectable first edition. 2002-09-05. Good. Ships with Tracking Number! INTERNATIONAL WORLDWIDE Shipping available. May not contain Access Codes or Supplements. May be ex-library. Shipping & Handling by region. Buy with confidence, excellent customer service! Bloomsbury USA, 2001-12-07. Hardcover. Used:Good. Bloomsbury USA. Hardcover. 1582341400 New Condition. . New. Bloomsbury Pub Ltd. PAPERBACK. 0747558213 New Condition. . New. Bloomsbury USA, 2001-12-07. First Edition. Hardcover. Fine/Fine. Hardcover with dust jacket. Stated First Edition. 1st printing (complete number line). Clean and tight. No markings. Ships in a box. Fast shipping from NYC! 2001-04-09. Good. Ships with Tracking Number! INTERNATIONAL WORLDWIDE Shipping available. May not contain Access Codes or Supplements. May be ex-library. Shipping & Handling by region. Buy with confidence, excellent customer service! Bloomsbury Pub Ltd, 2001. First UK edition-2nd printing. Hardcover. Very good/Very good. VGC.Bloomsbury,2001.First UK edition-2nd printing(10 9 8 7 6 5 4 3 2). Black hardback(silver lettering to the spine,two small nicks on the edges of the cover) with Dj(small stain marks/watermark and marks inside the edges of the Dj cover, small tear on the edges of the front Dj cover, a couple of creases and nicks on the Dj cover),both in VGC. Nice and clean pages with a small colour mark and a couple marks on the outer edges. The book is in VGC with ,light shelf wear on the Dj cover. Price un-clipped.284pp. Bloomsbury USA. Hardcover. 1582341400 Like New Condition. . Fine. Harper Perennial, 2002-11-05. Paperback. Like New. Like new softcover in excellent condition, no writing, non-smoking home, clean text, binding tight, free delivery confirmation on all US orders, West Coast, APO, Hawaii, Alaska, Puerto Rico should opt for "expedited" shipping. Save a tree. Read, Recycle & Reuse. Buy all your used books from Enough Books. Bloomsbury Pub Ltd. PAPERBACK. 0747558213 Like New Condition. . Fine. HARPER. New. 8.1 x 5.28 cm. London: Bloomsbury 2001. Hardcover. 9 1/2" x 6 1/4". X, 278 pp. Black cloth in white and gray photographic dust jacket. Light bumping to corners. Pages tanned. Otherwise clean and unmarked. Very Good. ISBN: 0747556865. . VeryGood. Hardcover . 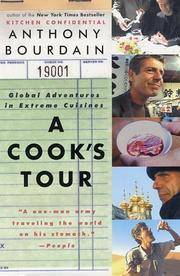 Anthony Bourdain - Cook's Tour - Paperback. Book. BRAND NEW. Ecco. PAPERBACK. 0060012781 . New. 2002. Raincoast Books, 2001. Book. Good. Hardcover. Canadian First. good reading copy, rubbing to covers, spine slightly cocked. spine tip wear. clean copy. G. K. Hall & Company, 2002-06. Hardcover. Good. BLOOMSBURY BOOKS @, 2001. Paperback. Good. Disclaimer:A copy that has been read, but remains in clean condition. All pages are intact, and the cover is intact. The spine may show signs of wear. Pages can include limited notes and highlighting, and the copy can include previous owner inscriptions. At ThriftBooks, our motto is: Read More, Spend Less.Dust jacket quality is not guaranteed. Bloomsbury Pub Ltd. PAPERBACK. 0747558213 Brand New ,Original Book , Direct from Source , Express 5-8 Business days worldwide Delivery. . New. Ecco Pr. Reprint. Cooking, Crafts & Hobbies. New. Brand New: This item is brand new unopened, never used and still in its original manufacturer condition. Bloomsbury, 2002. Paperback. As New. Trade paperback in white illustrated wraps. 274 pages. New unread book. Author of Kitchen Confidential soon to be a TV series. Multiple copies available. Ecco. PAPERBACK. 0060012781 Special order direct from the distributor . New. Ecco, November 2002. Trade Paperback. New. Bloomsbury USA. Hardcover. 1582341400 . Good. 2010. Bloomsbury USA, December 2001. Hardcover . 7.5 Bulk HB Standard. Harper Perennial, 2002-11-05. First Ecco Edition. Paperback. Used:Good.